Pori is a city and municipality on the west coast of Finland. Step off the beaten path and head to Katanpaa and Isokari Lighthouse. Relax by the water at Yyteri Beach and Herrainpaivat Beach. Explore the numerous day-trip ideas around Pori: Sastamala (Pukstaavi, The House of Mr. Clutterbuck, & more), Rauma (Marela Museum House, The Church of the Holy Cross, & more) and Kurjenrahka National Park (in Poytya). Spend the 2nd (Mon) exploring nature at Seitsemisen Kansallispuisto. And it doesn't end there: don't miss a visit to Juselius Mausoleum, take in the spiritual surroundings of Central Pori Church (Keski-Porin kirkko), browse the different shops at Kauppakeskus Puuvilla, and tour the pleasant surroundings at Kirjurinluoto. To see traveler tips, other places to visit, more things to do, and more tourist information, read our Pori trip planning tool . 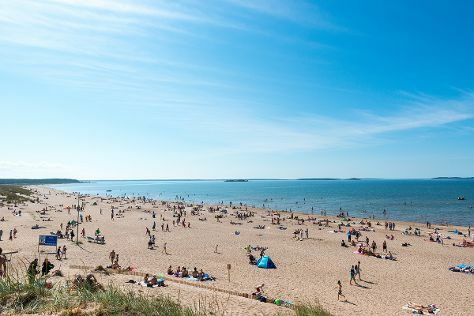 In August, daily temperatures in Pori can reach 22°C, while at night they dip to 12°C. Wrap up your sightseeing on the 6th (Fri) to allow time to travel back home.